When you trade-in through Gazelle, you get a $20 one-time use credit to purchase on our store. Put it towards a phone, iPad, or MacBook - anything you like. After we receive your trade-in you will get an email with a link you can use for the purchase. It's good for 7 days. Thanks! Your $5 bonus has been sent to your email address. Great! You selected your iPhone 8 to sell. It takes just a few minutes to sell your iPhone 8. 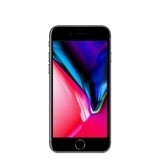 Select your iPhone 8 / Other to sell. What Happens When I Sell My iPhone? What Can I Sell to Gazelle?